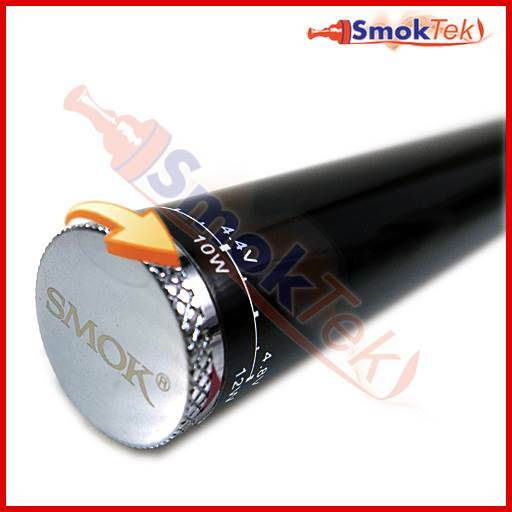 The eMax Winder style VV/VW battery is a variable voltage/wattage eGo battery made by SmokTech. 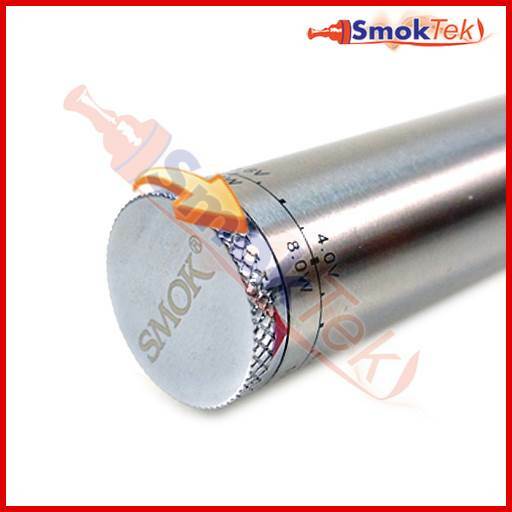 It uses smart technology which allows you to adjust voltage output from 3.2v ~ 4.8v or wattage from 4w-12w by spinning the knurled dial at the bottom. Regulated voltage output remains stable as battery is depleted. This battery has improved circuitry providing better reliability and greater protection. 5 clicks of the button will power your battery on and off, 3 clicks of the button will change between VV and VW modes - very easy to use! The eMax has a sealed 510/eGo connection and will work great with most 510/eGo threaded clearomizers on the market, like the Innokin iClear 16, Smok T-Dux, and Aspire K1. Short Circuit Protection: When short circuit happens, the battery will shut down and not function again until short circuit is removed. Safety Cutoff/Atomizer Protection: If you press the button for 8 seconds, the battery will be locked until the next press. Low Voltage Protection: When the battery voltage is lower than 3.3v, the battery will shut down. 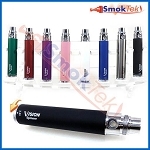 Once on, 3-clicks will switch between Voltage or Wattage modes. 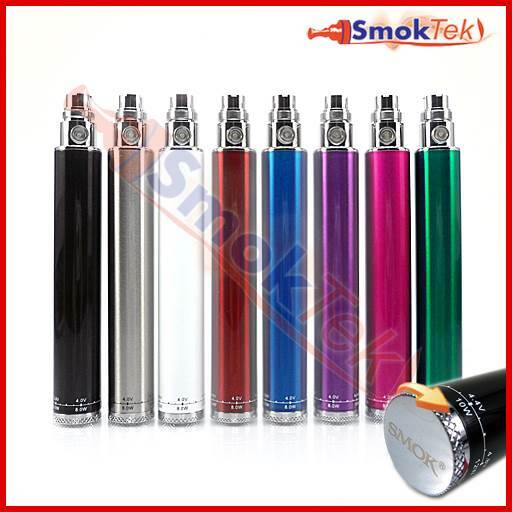 A fully charged eMax 1300mAh variable voltage battery can provide 14 or more hours of use. Using the battery at a higher voltage/wattage output will drain the battery faster than at a lower voltage. We suggest you to start with a low voltage/wattage and increase gradually until you find the right voltage/wattage for your atomizer/cartomizer. The battery can be charged with our eGo 420ma USB Charger or eGo 450ma USB charger, and recommended wall adapter. DO NOT charge using cell phone chargers/adapters, or any other 510 threaded charger if output is over 4.2V - it can cause damage. To charge, simply screw the battery onto the USB charger and plug into a USB port (or, if using with a Wall Adapter, plug into a wall outlet.) The LED light on the charger will turn from RED to GREEN once the battery is fully charged. Never leave batteries charging unattended. Remove from charger once the battery has finished charging to prevent damage. Pick up an USB charge cable and a wall adapter at a discounted price when you Make it a Kit from the menu above! Great battery. Lasts all day with constant vaping. Quick recharge 3-4 hours. Watt and volt adjustments allows for finding your sweet spot on any combination. Buy it, you won't be dissapointed. These batteries are awesome, very powerfull and they look good too. Q: I ordered 2 of these & am wondering if you can give me a ballpark or reasonable expected life for recharging them. In other words approx. how long may they last? I realize you cannot give any detailed answer. If it helps any, I can tell you I recharge them once a day. Estimate please if possible. I'm glad to help here! Charging time for the eMax VV/VW 1300mAh eGo Battery is approximately 3-4 hours. Q: Can you use a IPhone wall plug in to charge the USB or will that damage the charger? The battery can be charged with our eGo 420ma USB Charger or eGo 450ma USB charger, and recommended wall adapter. DO NOT charge using cell phone chargers/adapters, or any other 510 threaded charger if output is over 4.2V - it can cause damage. To find the appropriate wall adapter, please type in the search bar "USB Wall Adapter" and click the one with 500 mAh output. I hope this helps!